This desire for validity” and importance” may ring familiar to design scholars, and indeed, Cameron Tonkinwise opens his chapter, Post-Normal Design Research: The Role of Practice-Based Research in the Era of Neoliberal Risk,” by acknowledging that practice-based design research has exhibited a defensive insularity as it tried to shore up its epistemological claims throughout the 2000s.” He goes on to historicize the evolution of design across the last century as it achieves increasing complexity and its practitioners glean both an awareness of its potentials and its deficiencies; the emergence of this reflective practice is not insignificant. Tonkinwise writes, This means that the practice of expert designing involves precisely the sorts of meta-cognitive, processual knowledges that characterize a discipline.” He goes on to outline a series of other factors, including an increasingly complex technological and multicultural society, that, in turn, require new forms of social research, new accounts of creative cognition and new modes of communication, persuasion and alliance building.” With this contribution, Tonkinwise deftly situates design within a broader historical, theoretical and disciplinary context, which in turn may set the stage for the defensiveness characteristic of so many discussions of design research to be relinquished once and for all. We can only hope, and keep pushing thoughtfully and diligently to try to achieve this important goal. Tonkinwise’s chapter is one of four that open the book and together explore a variety of models for doctoral education in design. A second section comprised of five chapters is titled Socio-Cultural Impacts of the Design PhD in Practice,” and charts a specific array of permutations of design education, including an overview of knowledge exchange as it occurs in the Creative Exchange Hub jointly established by Lancaster University, Newcastle University and the Royal College of Art. The book’s third section looks specifically at program structures, and the fourth offers a platform for reflections by graduates, who explore the process and results of earning a Ph.D. in design. Lisa Grocott’s thoughtful rumination stands out in this section due to its poignant consideration of the painful process of disassembling her entire practice, a process that she describes as a holistic agitation of troubling all that I knew” that ultimately leads her to articulate her work with great nuance. She writes, Each incremental move a designer makes is ultimately about using generative, creative, material, performative, critical action to better assess potential.” For Grocott, design research comes ultimately to be about crafting futures.” With its combined specificity and breadth, the book is a very productive resource for anyone involved in doctoral education in design, as well as in the arts and other areas in which the notion of practice has become central. With regard to its fundamental usefulness, the book addresses an array of pedagogical topics with clarity and detail. In Chapter 5: Designing the Ph.D. Curriculum in the Design Disciplines,” for example, Henry Mainsah, Andrew Morrison, Jonny Aspen and Cheryl E. Ball describe the evolution of the Oslo School of Architecture and Design’s Ph.D. curriculum as it has shifted through three phases, moving from a program that they characterize as architecturally centered with emphasis on the making professions with a lecture and seminar-based pedagogy.” The program’s second stage used a task-based pedagogy and was oriented around socio-cultural questions; the third stage adopted a thematized, interdisciplinary approach with focus on contexts of inquiry and research methods with staged activities.” This thoughtful examination of growth and change displays enviable self-awareness and introspection. In addition to curriculum, the book devotes attention to a frequently elided aspect of the doctoral process, namely the supervision of Ph.D. candidates. While Ph.D. programs in other disciplines may boast a fairly stable canon and a time-tested methodology, design research, with its widespread application, eschews such stability and orthodoxy; doctoral students may explore a wide array of topics, from urban planning to climate change, and they are often invited to engage in numerous methodologies, making supervision complex. Pelle Ehn and Peter Ullmark sum things up nicely in their chapter, Educating the Reflective Design Researcher,” when they write that supervising Ph.D. students in design is not something that can be achieved with ease.” Their chapter details techniques for rectifying this problem. 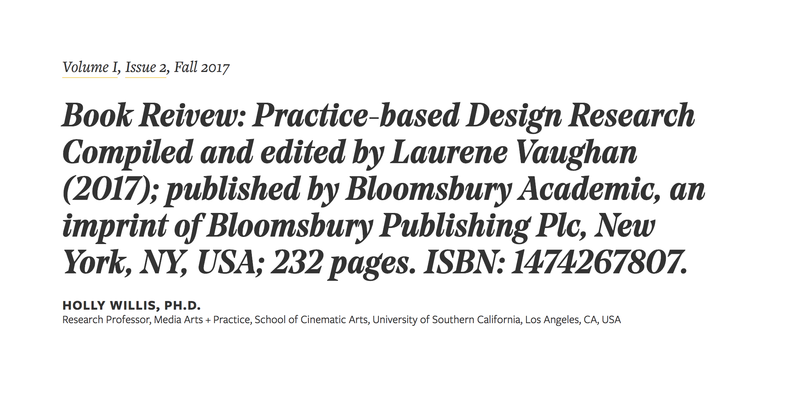 Finally, the book is a treasure trove of sources; readers will find reference to the familiar icons of design education—the pragmatism of John Dewey, the reflective practitioner elaborated by Donald Schön and the practitioner-researcher developed by Peter Jarvis, to name a few examples. However, there are other voices as well: Jean Lave, Etienne Wenger and Howard Gardner signal attention to learning theory, and reference to Theodore R. Schatzki points to the practice turn” across disparate disciplines more generally. Overall, the book provides insight into fundamental aspects of design education at the doctoral level, covering curriculum design, pedagogical models, disciplinary context and evolving modes of scholarly communication and practice, all from the perspectives of active educators. The addition of statements from doctoral students offers much-needed specificity. What the book does not do is step back and assess the evolution of the idea of practice-based research more generally. Proponents of arts-based research, for example, engage many of the same topics, fight many of the same battles and weather similar forms of academic disenfranchisement. Nor does the book attend to the changing status of the university within a neoliberal culture in which design, understood in its most basic and practical sense, plays a key role. Vaughan highlights shifts in methods and applications in design, which in turn call for a new kind of designer,” but there is little connection to the burgeoning critique of a market-driven academia. One could rightfully argue that this link is not part of the book’s already full agenda. However, so much of what is presented here —an awareness of alternative ways of knowing through embodied making, alongside attention to the political economy and the deeper systems” of design presented by Bonne Zabolotney in her chapter—make that connection feel almost nascent. But these are the complaints of a greedy reader! As it is, Practice-based Design Research makes a terrific contribution to the longstanding debates about doctoral education in design, demonstrating achievements sustained over the last two decades while pointing toward new directions as design both engages with the highest echelons of academia and generates provocative and forward-thinking research methods. 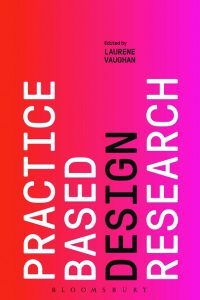 Vaughan, L. Practice-based Design Research (Kindle Edition). New York, NY, USA: Bloomsbury Academic, 2017; p. 273.